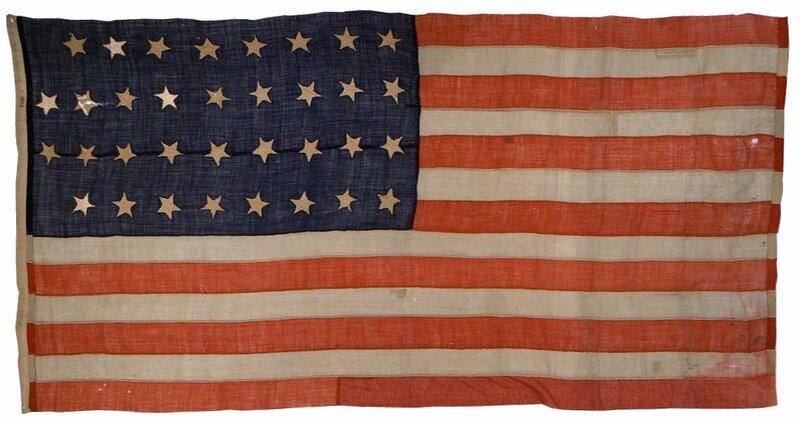 This beautiful Civil War Era flag is entirely hand-sewn and was likely cottage industry made. Its almost 9 foot length indicates that the intended purpose was probably for use on a ship or government building. Its beautiful coloration is evidence that it was made of high quality materials for the period, another indication that it may have been made under contract for official use. The flag's 8-9-9-8 pattern of stars, in just four rows in a notched configuration on an elongated canton is both rare and striking. The flag was acquired from the estate of the French family of Massachusetts. Verbal family history holds that the flag flew over Washington, D.C., during the height of the Civil War and was brought back to Massachusetts by Sergeant Major Daniel F. French, E Company, 56th Massachusetts Volunteer Infantry Regiment. The 34 star flag was adopted with the admission of Kansas as the 34th state in January 1861. It was used until 1863 when West Virginia became a state. At no time did the national flag lose stars; since the United States believed that secession from the Union was illegal, the flag continued to bear the stars of all the states of the union, even the Southern states. Flag makers had several designs for the 34 star flag, this particular flag having just one of them. This flag is completely hand-sewn. The blue canton is pieced from two lengths of wool bunting which are joined with hand-stitched seams. The cotton stars of the canton are single-appliqued on the blue ground. The hoist end is composed of heavy-duty, double-layed cotton with holes at top and bottom for the halyard. The name "Mamie Curtis" is written in period ink on the hoist end, perhaps the name of the woman who originally owned or created the flag.